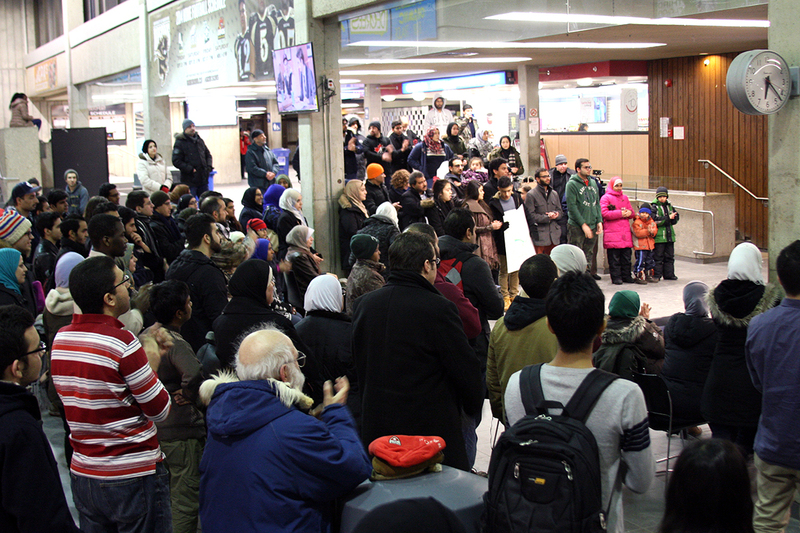 Members of Winnipeg’s Muslim community hosted a candlelight vigil at the University of Manitoba on Friday, Feb. 13 to pay tribute to victims of a triple homicide – the three Muslim students who were killed in Chapel Hill, North Carolina earlier this month. Craig Hicks shot and killed Yusor Mohammad Abu-Salha, 21; her husband, Deah Barakat, 23; and her sister, Razan Mohammad Abu-Salha, 19 in the victims’ apartment on Feb. 10. Chapel Hill police have reported that the incident was the result of a parking dispute. Friends and family of the victims have called that determination premature and suggest that the shooting was motivated by religious hatred. Suzanne Barakat, sister of Deah Barakat, has been speaking out to the media, arguing that there was more to the attack than an argument between neighbours. Following the incident, there has seen an outpouring of support for the slain students through rallies and charitable fundraising. The candlelight vigil hosted at the U of M began with a series of speeches, ending with a moment of silence, held at the Fireside Lounge in University Centre. Over 100 people were in attendance, including students and non-students of all ages. Rami Elzayat, one of the event organizers, said it was important that the event be held on campus. Speakers at the event included U of M president David Barnard; Zeeshan Zamir, president of the U of M Muslim Student Association; Jeremiah Kopp, UMSU vice-president internal; Lynda Trono, United Church minister and chair of the education committee of the Manitoba Multifaith Council; Shaden Abusaleh, U of M global political economy student; and grade 12 student Aboudul qudus Abusaleh. Shahzad Musaddiq, U of M alumnus and director of the Canadian Muslim Leadership Institute, served as MC for the event. Musaddiq said that the Muslim Student Association provided a lot of support in coordinating the event, but that the organizing work represented a broader effort from Winnipeg’s Muslim community. “This is kind of unique because it’s not really a group formally. We all represent different organizations in the city. Maryam Bezzahou, Association Etudiante de l’Université de Saint-Boniface representative of student life, was in attendance at the event. She said that she hoped the event could raise awareness of violence towards the Muslim community. “Their deaths are tragic, but it happens all over the world. So we’re here not only to support their work and to honour them, but also to raise awareness for all those other people: all those other Deahs, and Yusors, and Razans all over the world that are neglected, that we never get to hear about because of the media and lack of coverage. Ifrah Zohair, a second-year student in the faculty of science, also expressed concern about what she called a lack of media coverage in the days following the murders. “When something like this happens, when Muslims are on the other side, it’s just not represented enough so people don’t know about it. And I think that’s what we wanted to do, create awareness, but then also come together and celebrate their lives and join together in peace to kind of say we’re with you and we’re sorry for their loss for their families.